Out of stock, but we are accepting pre-orders. Order now and your card will not be charged until we ship (except Amazon Pay). The Nissan/Thermos TGS1500 thermal carafe can be used for hot or cold beverages. It can substitute for the KBT-741 1.25 liter carafe but will not fit other thermal models. But, it is equally comfortable in home or office for a range of heat keeping applications including hot water, tea, coffee or for cold applications such as dairy, iced water, etc. 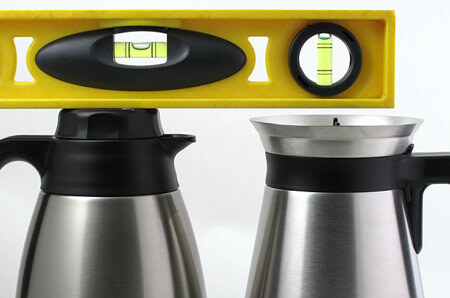 The standard lid (supplied) has a thumb lever for pouring. The optional brew thru lid can be used for directly brewing coffee, providing the carafe fits beneath your brewer's grounds basket. The carafe keeps beverages hot for up to 12 hours and iced for up to 24 hours with double wall vacuum insulation. A large mouth opening makes filling and cleaning easy. Body stays cool to the touch with hot liquids and is condensation-free with cold. Carafe can be used with ice for extra cold refreshments. 18/8 stainless inside and out. BPA free. Dimensions: 6.5" W x 4.5" D x 9.5" H.
All 1.25 liter Technivorm thermal brewers allow you to use their brew through lid on their original carafe. 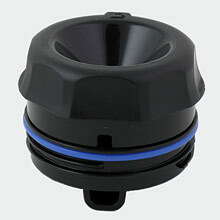 This lid largely eliminates heat loss during brewing. After brewing completes the pouring lid gets put on the carafe. 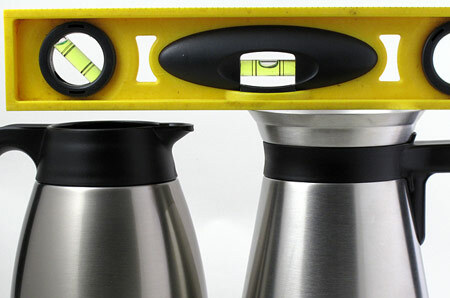 Because of height differences, the Nissan thermal carafe, when used with its own brew thru lid, will only fit beneath the Technivorm KBT-741 model. Nissan (left) and Moccamaster both with brew thru lids in place. The Nissan is higher by about 1/4 inch. Nissan will not fit beneath the KBT-741 brew basket unless the brewer is propped. It will fit beneath other models. Nissan (left) and Moccamaster both without brew thru lids in place. The Technivorm is higher by about 1/4 inch. Nissan without brew thru will fit beneath KBT-741 only.